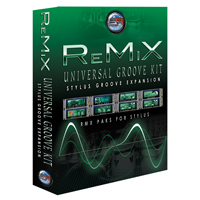 We are proud to announce our new loop product, Universal Groove Kit for Stylus RMX. The Universal Groove Kit for R.A.W. (Rex2/Apple/Wave) has been a bestseller on eSoundz, and we are delighted to now offer this title formatted specifically for Stylus RMX.